India Test skipper Virat Kohli has expressed happiness at having recorded his maiden double century in the longest format of the game after he endured a forgettable West Indies tour five year ago. "Yes, it is a very good feeling. I made my debut here and it wasn't a memorable series for me," Kohli was quoted as saying by Bcci.tv. "Coming back here and getting a double hundred gives me a lot of satisfaction purely because of the fact that I have missed a couple of big scores in the past. I know I have the ability to get big hundreds. This is my first double hundred in first-class matches in general, so this is something I always wanted to do and I am feeling really grateful today that I was able to cross the mark," he said. The 27-year-old prolific batsman continued his scintillating form from the first day, adding another 57 runs to reach exactly 200 just before the lunch interval. In the process, he also became the first Indian captain to score a Test double-century away from home. Reflecting on his feat, Kohli said: "It is just a very good feeling. Test cricket is the most important format as far as I am concerned and the whole of team is concerned, so when you do well in Test cricket, it gives you the job satisfaction like nothing else. I am really happy for this moment." Kohli and Ravichandran Ashwin, who hammered his third Test century, set up India's declaration of 566 for eight on the second day of the opening match on 22 July. In response, West Indies lost Rajendra Chandrika, leaving opening partner Kraigg Brathwaite and nightwatchman Devendra Bishoo to resume on the third morning at 31 for one. 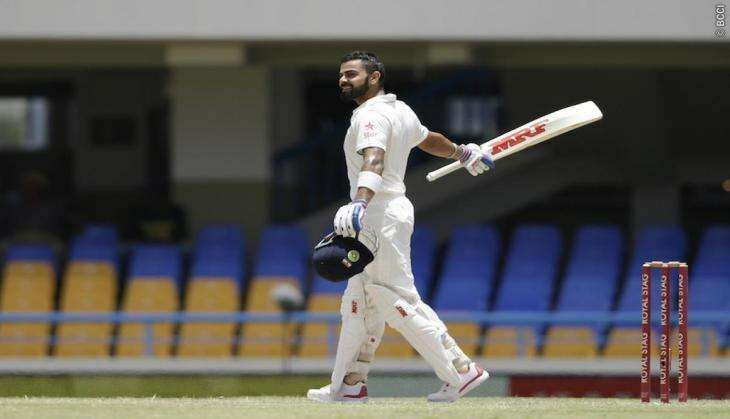 Kohli also praised his side's batsmen for stepping up despite playing with only five specialist batsmen in the Antigua Test. "We had very important contributions by Shikhar (84); understanding the responsibility. Ashwin batted beautifully and got a hundred (100) as well. Saha (40) contributed well and Mishra made 60 odd (53) in the end. All in all, it was a very good batting effort by everyone and something that we can be proud of. It is a bit of an added pressure (on the batsmen) but something that is what you want at this level of cricket," he added. Go Goa (and Manipur) gone: Why is Congress ignoring these two states?